Are you a professional looking to improve personnel safety in the healthcare environment through the appropriate use of personal protective equipment (PPE)? As you probably know, federal and state occupational safety and health administrations (OSHAs) issue workplace health and safety regulations that must be adhered to, including under what circumstances PPE is used. Respirators can be a key type of PPE when it comes to helping protect healthcare workers. But, there are several factors that you must first consider that may influence respiratory selection decisions, such as whether the protection is for particulate exposure only, gas or vapors, or a combination of both. Another factor would be if splash or spray protection is needed. You may also need to consider the category of isolation precautions you need to comply with, as well as durability, comfort and exposure reduction. Respiratory protection may be used in healthcare for a variety of purposes, such as to help protect users from certain particulates, cleaning chemicals, hazardous drugs, and infectious aerosols (e.g. Mycobacterium tuberculosis). There are a few types of respiratory protective equipment commonly used in hospital and healthcare settings. For instance, disposable respirators are the most frequently used respirators used in hospitals. Some are approved for use as surgical masks. Powered air purifying respirators (PAPR) can also be used for many different types of situations in healthcare settings. A PAPR, as defined by US OSHA, means an air-purifying respirator that uses a blower to force the ambient air through air-purifying elements to the inlet covering. According to the National Center for Biotechnology Information, the use of PAPRs in healthcare settings is increasing. But why? There are many reasons that may contribute to this emergence in new respiratory protection. One reason, for example, may be fit testing. According to US OSHA, “A fit test tests the seal between the respirator’s facepiece and the employees face. It takes about fifteen to twenty minutes to complete and is performed at least annually. After passing a fit test with a respirator, you must use the exact same make, model, style, and size respirator on the job.” This would be considered an annual expense and is the duty of the employer to complete. However, the loose-fitting headgear found in many PAPR systems does not require a fit test. This means healthcare workers only have to be clean-shaven along the skin surface where the respirator seal occurs, which means healthcare works can have limited amounts of facial hair. Furthermore, technologically speaking, the PAPR has come a long way in the last 40 years. What was once a PAPR “body” with a motor and some wires, capable of turning off and on with maybe a few small indicators of power, have evolved. Now, PAPRs are much more sophisticated systems that allow for greater comfort because of ergonomic designs as well as more features for the wearer that gives them more options. 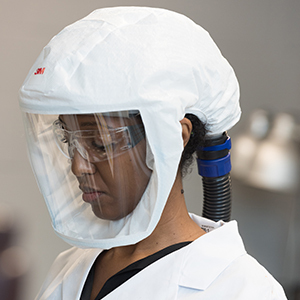 PAPR systems can include loose-fitting hoods or helmets that come equipped with a battery-powered blower to pull air through a particulate filter, chemical cartridge, or combination particulate/chemical cartridge for the wearer to breathe. Some PAPRs come with rechargeable lithium-ion batteries which may last longer and charge faster than older battery technology such as nickel metal hydride, adjustable airflow options, and a range of NIOSH approved filters and cartridges that can be used to help protect against hazards associated with the handling of certain hazardous drugs and cleaning/disinfecting operations. This variety of options can help you customize your protection for what you are exposed to in your healthcare setting. There are different donning, doffing, cleaning and disposal procedures for each kind of PPE that need to be adhered to and should be reviewed when selecting the appropriate PPE for your healthcare setting. Healthcare employers should also make sure that they have policies and procedures that clearly outline the hierarchy of safety and health controls they have in place to protect their workers. From engineering controls to eliminate hazards to training and administrative controls to then finding the right PPE, it is important to review and evaluate these protocols to maximize keeping people working in healthcare settings safe. A healthcare facility that uses PAPRs or any respirator is required to have a respiratory protection program in place as specified in 29 CFR 1910.134. To learn more about how to implement and manage a program, please see our Center for Respiratory Protection. To learn more about PAPRs or other respiratory protection products used in healthcare and how they can help your healthcare workers, please do not hesitate to reach out to us at 1-800-228-3957 to speak with our technical service specialists. Insights for health and safety managers regarding how the latest changes to intrinsically safe standards impact new products.